A Different Kind of Marvel Movie? Aren: It seems that every time a new Marvel movie comes out, someone claims it’s a different kind of film than what we’ve seen before. But is there such a thing? The Marvel Cinematic Universe is the most homogeneous series in all of cinema. The visual styles, the verbal wit, the interconnected plotting, and the fanciful narratives are essentially identical from film to film. Instead of standing out as individualized films from artists with different creative visions, the Marvel movies feel more like episodes of a television series. They’re consistent, but a tad bland and unadventurous. Anders: One way to look at it is that the Marvel Cinematic Universe is the cinematic equivalent of comfort food. They come out on an increasingly regular schedule, offering up exactly what audiences expect. No more. No less. This is part of the very function of genre films, which constantly must balance the push and pull between originality and convention: audiences return because they know what to expect, but there must be something that justifies them seeing a new film and not simply, literally re-watching the same film. The Marvel films have satisfied these urges by sticking, as you note, to a very consistent visual and narrative schema. The originality is simply in seeing new characters, some beloved, some obscure, brought to the screen for the first time. Doctor Strange, a character whom casual comic book readers and most general audiences will be unfamiliar with, is simply the latest of these comic book heroes brought to the big screen. Aren: At leastDoctor Strange is something different. Narratively, it’s no different than Iron Man or Thor. It’s a conventional origin story about an arrogant man becoming humbled and choosing to be a hero. Formally, however, Doctor Strangeis unique from all the other Marvel films. Aside from the post-credits scenes, it ignores most of the inworld universe in favour of exploring sorcery and the spectral plane. Its cinematography consists of harsh shadows, extreme wide shots and narrow close-ups instead of the standard medium-wide coverage of the other films. It’s full of psychedelic visuals straight out of a 1970s progrock album cover or Alejandro Jodorowsky film. To sum up, it feels like a movie first and a chapter in an interconnected series second. Anders: I would agree. Doctor Strange, perhaps in part because of his obscurity outside of certain circles of dedicated Marvel acolytes, is able to buck the mold to some extent. Certainly the excellent cast, including Benedict Cumberbatch as Stephen Strange, Chiwetel Ejiofor, Tilda Swinton, Mads Mikkelsen, Rachel McAdams, and Benedict Wong, makes this feel as if it is a slightly more upscale affair. But the filmmaking itself, you rightly note, does contribute to the success of this film in its own right and not merely the latest chapter in the MCU. In short, I agree with you. I think I would have liked this film even if it were a truly stand-alone film, maybe even would have liked it more. Aren: I’d agree with you there. 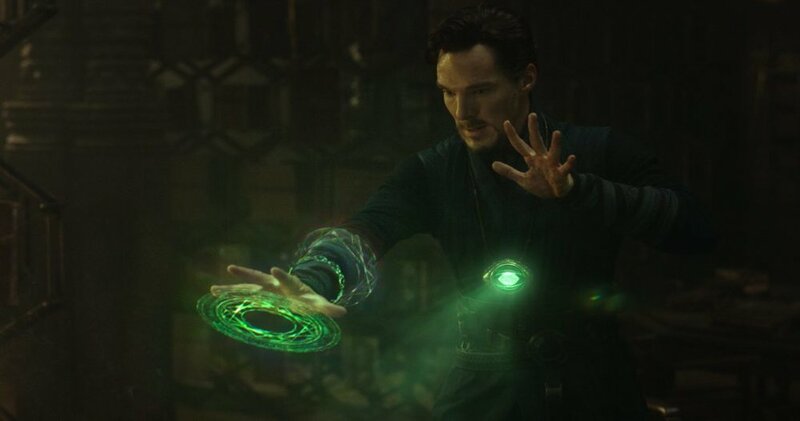 I think if Doctor Strange didn’t have the post-credits scene and wasn’t connected at all to the MCU, it’d feel more bold and I’d likely be even more enthusiastic about it. Anders: As soured as I am on post-credits scenes in general, I must admit the one with Thor in this film did have a good gag that had me chuckling. Aren: The effects genuinely blew my mind. If I’m going to see a big budget superhero movie, I want to be wowed. I want to see things that are not possible nor desired in small films. Doctor Strange delivered what I wanted. Anders: Yes. This is a film that manages to show its budget up on the screen. I felt like this was a film that was well worth seeing on the big screen, and even in 3D. The 3D here may be the best use of the technology in any of the Marvel films to date. 3D makes some of the sequences when space itself is bent all the more stunning. In moments, one feels like one is going to fall into the screen itself. Really, it is perfect for bringing the various realms of Doctor Strange to life. Aren: I didn’t see it in 3D, but I was stunned nonetheless. Much of this is due to Scott Derrickson’s visual style. In his horror films, Sinister and Deliver Us From Evil, you see that he favours high contrast lighting and anamorphic close-ups. Much of this style crosses over to Doctor Strange, where Derrickson loves to drape mansions in darkness or have Strange read by candlelight in a library. It’s not as stunningly formal as a Fincher or Anderson film, but it’s a great improvement over the bland television visual filmmaking of the Russo Brothers. More than that, it fits the world of Stephen Strange. This is a world of magic and robed figures in the dark, saving us from hidden evil. It makes sense that the visuals would be mysterious and both beautiful and terrifying. The effects are the most inventive in modern superhero films. Many of the scenes look like they take place in M.C. Escher drawings. You can tell that Derrickson took inspiration for the visual effects of Inception and ran with the concept of bending worlds and gravitational switches. If you’re going to have a character who can warp space time, I am glad that the filmmakers don’t shortchange the audience and lean into his wonderful powers. Anders: Yes, I particularly liked those sequences when the cities are bent and turned upon themselves, and also when Stephen finds himself in the other realms of the mulitverse beyond our own. The only way that I can really describe it is kaleidoscopic: as the various planes of the astral realms bend into each other, they also morph and are transformed. It really is a fine use of computer FX. Aren: As well, the finale plays on the standard urban destruction of the modern superhero film but does something interesting with it. By having the destruction occur off-screen, and then having Strange rewind the obliteration of downtown Hong Kong, we’re given a new vantage of a conventional Hollywood movie, which makes it newly exciting. There’s a meta-comment here about new perspectives of the conventional climax. That to really wow audiences, you need to undo what has been done and bring them something they’re not expecting. Anders: Yes, the finale in Hong Kong is, as you say, a meta-commentary on massive destruction in these superhero films. However, I will say I appreciated how it emerged naturally out of the rules that had been previously established in the film and not out of a winking or scolding of other films or film series. Aren: You’re right. The film doesn’t present the climax as a better alternative or more exciting than the climaxes of The Avengers or The Winter Soldier, but merely as one appropriate to the world of Stephen Strange. Aren: Stephen Strange is very similar to Tony Stark. He’s rich, arrogant, smart, but completely selfish. He’s a neurosurgeon, but he only treats patients who he knows he can cure, so as to sustain a perfect record. This proves that he’s not in it for philanthropy’s sake, but for the sake of pride and personal gratification. The plot is a standard humbling. He is brought low by the crippling of his hands in the car accident, has to accept his own futility when he ventures to Kathmandu and joins Kamar-Taj, has to learn a new spiritual mindset that replaces his materialist worldview, and then combines his terrestrial talents for improvisation with his newfound spiritual powers to become a hero. Anders: I felt that, befitting the spiritual mindset of the film, it was interesting that Strange’s final confrontation with Dormammu involved him being willing to sacrifice himself. Again, it reminds one of the scene in The Avengers when Tony is willing, but hopefully this has a more lasting impact on the character. Unfortunately, much of the appeal of characters like Tony Stark and Stephen Strange is that they are aloof and consider themselves better than others. But, somehow, given the nature of the character, I have a feeling Stephen Strange may have gone through a more lasting transformation. That said, with all the talk of whitewashing in the film, the part that still is an unfortunate cliché of such characters is the way that he travels east to Kamar-Taj (moved from Tibet as it is in the comics to Nepal, in order to appease Chinese distributors) only to end up becoming even better than anyone else in the order in a very short time. I find this trope lazier than even making the Ancient One a white character (which Derrickson has discussed the challenges he faced in a candid and honest interview). It’s certainly not one that is limited to this film or even comic books specifically, but does undercut the sacrifice and hardwork angle as well. When will we have a story about a character who only achieves success after hard work and long suffering? Perhaps it’s just the nature of the fantasy story, but I digress. Aren: It could also be the nature of fitting this sort of hero’s journey into a two hour narrative. We want our hero to be the most heroic onscreen, so we have to exalt him or her above all others, despite his or her skillset being obviously shallower than his or her teachers’. Still, it’d be nice to finally get a big blockbuster film about the character who works super hard and gets better despite not being pegged the destined hero. Perhaps another time. Aren: Doctor Strange is not as obviously religious as Deliver Us From Evil, but it still slips in some comments on spiritualism and the need to let go of material selfishness. The Ancient One has two key speeches to Strange: one occurs when she first meets him and opens his mind to the spectral realm. She sends his consciousness on a journey through the cosmos and dimensions. The second speech is her farewell address to him, as she discusses the need for selflessness when she talks to Strange in the spectral realm while she’s dying on the operating table. In both, she pushes against his materialism and the notion that his individualism is key to his own moral journey. I thought it was interesting, even if I wish Derrickson had been allowed to lean further into developed mysticism and theology. Anders: I find the way the film manages to push beyond merely the scientification of magic in many superhero films (such as the way that the Thor movies so far portray the Asgardian forces as merely powerful aliens) fairly successful. While the Ancient One uses the analogy to technology and programs, the magic here is not merely that. It is instead the tapping into another realm or reality. Doctor Strange is successful in not only making the magic comprehensible, but in creating a believable sense in which some forms of knowledge exist other than our modern scientific ones. But, as you note, it links the use of this knowledge to an ethical problem was well, which challenges our notion of reality. That is, our ethical stance is deeply bound to the nature of our material reality. Kamar-taj and the Sanctums’ roles in protecting our realm is then not enforcing a strict spirit-material world divide, but rather a kind of holistic, more complete knowledge. And I appreciated that. Aren: For someone who is growing increasingly detached from the Marvel Cinematic Universe, I was greatly surprised by Doctor Strange. It’s one of my favourite of all the MCU films, probably only behind one or two of the Captain America films. I think its differentness, as we discussed earlier, is key to my appreciation of it. After thirteen films that increasingly played like blown-up TV episodes, I was glad to watch a genuinely cinematic film with a good, if conventional, story and character arc. What did you think? How does Doctor Strange rank among the other MCU films? Anders: I would agree. The film takes what might be seen as a second-tier hero and turns in one of the more satisfying debut films in the series. I’d rank it only behind the first two Captain America films and The Avengers myself. And while I’ve been growing tired of the MCU as well, this does give a glimmer of hope that interesting things can still be done with these characters. Directed by Scott Derrickson; written by Jon Spaihts and Scott Derrickson & C. Robert Cargill; starring Benedict Cumberbatch, Chiwetel Ejiofor, Rachel McAdams, Benedict Wong, Michael Stuhlbarg, Benjamin Bratt, Scott Adkins, with Mads Mikkelsen, and Tilda Swinton.